Felix Rosenqvist bagged another four DTM championship points at Hungary’s Hungaroring this weekend, simultaneously leading the Mercedes-AMG DTM charge for the first time in both qualifying and race conditions. 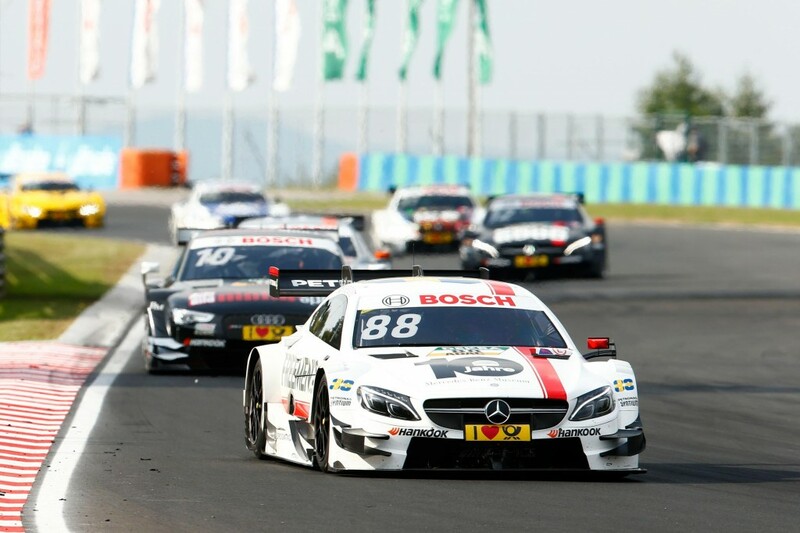 Rosenqvist, who debuted in the DTM through a mid-season graduation from reserve driver duties last month, qualified a strong ninth on the grid for Saturday’s opening race at the Budapest venue, spearheading the eight-car Mercedes contingent in the process. The Swedish rookie also came within hundredths of upsetting an Audi lock-out of the top eight grid slots, despite the Mercedes-AMG C 63 DTM machines running a full 25 kilos heavier due to the DTM’s performance weight system (based on previous qualifying results). In Race 1, Rosenqvist then squeezed his way up to eighth in the first corner, before maintaining his position across the line to claim his second points-paying result from just five DTM races. He again headed the Mercedes assault. On Sunday, Rosenqvist was restricted to 24th and last on the grid for Race 2 after suffering from car damage in the preceding qualifying session. Locked in a train of cars in the early stages of the race, he engineered his way forward by exploring the ”undercut” strategy with an early pit stop, using a set of fresh tyres to leapfrog his immediate rivals thanks to a string of fast mid-race laps. As it was, he eventually came home 13th*, as the third-best Mercedes representative. “We had some problems in second qualifying that unfortunately left us too far back to realistically make the points,” Rosenqvist continues. “We still managed to get pretty close, and in general I’m actually really happy with this weekend. The pace has been competitive given the circumstances, and that makes me really optimistic of even better things at Hockenheim in three weeks’ time. The Budapest event marked the start of an intense autumn schedule for Felix Rosenqvist, comprising four consecutive weekends of racing in four different countries and three different championships. Next up on the agenda is next week’s Blancpain GT Series Sprint Cup finale in Barcelona, with Rosenqvist then set to commence his brand new FIA Formula E Championship adventure in Hong Kong on October 9 before returning to Europe for the DTM climax at Hockenheim (Germany) on October 14-16. * Numerous hours after the second race, the stewards announced their decision to disqualify Daniel Juncadella and Marco Wittmann, who had originally finished the race in third and fourth respectively. As a result, Felix was promoted from 13th to 11th in the re-classified results.